You spend hours stretching, eating right, and getting enough rest, so you would never think of using subpar or damaged equipment when engaging in your favorite activity. 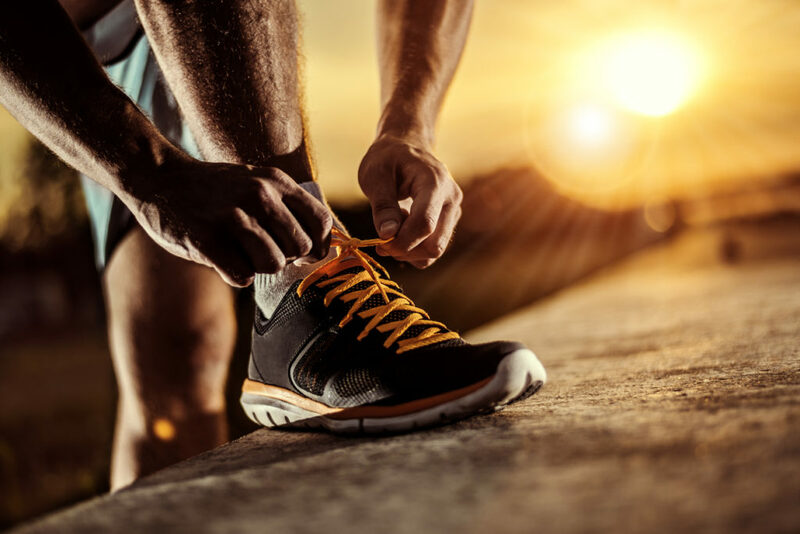 Whether you’re a runner, play hockey or tennis, or like to go on long hikes, proper footwear can make the difference between enjoying your favorite activity and being sidelined by injury. Here’s some reasons why proper footwear is key to preventing sports injuries. Rarely does a sport not engage your feet, ankles and knees. In fact, the amount of pressure and impact placed on your lower extremities can leave you vulnerable to strains, sprains, fractures and wear and tear. Choosing the right footwear is key to avoiding sports-related injuries. By investing in a quality pair of athletic shoes that is appropriate for your sport and accommodating to your body type and level of activity can increase protection and up your game. Proper and good-fitting footwear can help you limit or avoid more common yet debilitating sports injuries such as ACL (anterior cruciate ligament) tears and damage to the kneecaps, shin splints and stress fractures, hip flexor strains at the upper front side of the thigh and tendonitis. Shock Absorption. When playing or running, your feet are experiencing constant loads of pressure and friction. Shock absorption means you feel it less and so does your body. By ensuring your shoes are properly cushioned – and in all the right places – you lessen the impact that can take their toll on your bones and joints. Traction impacts performance, particularly in sports that involve cutting, sprinting, and quick shifts of direction. But higher traction doesn’t mean better performance. Excessive traction can put you at risk for injury, most often of the ankle or knee. When considering traction, consider not staying “put” on the floor, but rather ensuring that you don’t slip and slide unnecessarily. Traction should allow you to move, pivot, jump and slide properly, not only on the courts, but on the road and track. Ankle support. Proper ankle support will limit side-to-side movement and maintain the foot aligned with the ankle, avoiding a pulled ankle or ankle sprain. Consider wearing additional soft ankle braces. Be sure your shoes aren’t too high that they dig into your Achilles tendon or cause blisters. This is especially important in sports like skating and hockey, skiing, and basketball. Arch support. Make sure your anatomy works with the built-in arch support, or consider orthotics, designed specifically for you. When purchasing running shoes, ask for a diagnostic test to evaluate your gait. You may need a stability shoe if you tend to pronate, or a neutral shoe if you have a normal to high arch. Purchase what you know. When it comes to your well being, it’s sometimes best to stick with what you know. Current trends, like minimalist shoes, may be interesting but may not be right for you. Likewise shoes with “air” may not be best to support heavier or more extreme sportsmen. There is no rule of thumb when it comes to replacing athletic shoes, but you can keep an eye on sole wear, support, and condition. When the shoe begins to feel less supportive and uncomfortable, it’s time for a new pair. Likewise, if you haven’t worn the shoes for a very long time – even if new or hardly worn – consider that the supports and cushioning may have started to compress or stiffen, meaning that a new pair of shoes may be in order. The doctors and specialists at Orthopaedic Associates of Central Maryland offer the most innovative and comprehensive care to keep our patients moving with ease and comfort. Give us a call and bring your athletic shoes! We can help diagnose your injury or concern and make sure you and your shoes are good match! To schedule an appointment with one of our board-certified fellowship-trained orthopedists or world-class physical therapists, call (410) 644-1880 today or you can use Klara to send us a message.